There are few things to dislike about Big Timber. Located in southern Montana, Big Timber has a superb location for the angler, as the Yellowstone River and the Boulder River flow right along the edge of town. The scenery is hard to beat, too, as the Crazy Mountains dominate the landscape to the north while the Absaroka-Beartooth Mountains lie to the south. 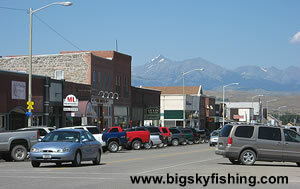 Big Timber is a very small town, having only a population of around 1800 people. Yet during the summer months, Big Timber becomes a very busy place. Interstate 90 brings large numbers of people into town in search of gas and other supplies. Plus, Big Timber is the jumping off point for many excursions, either by foot or by horseback, into the Absaroka-Beartooth Mountains found to the south of town. Not in the mood to fish? Well, no worries, as there’s plenty of other things to do besides chasing the trout. Three scenic drives begin just outside of town: the Crazy Mountains Backcountry Drive, the Boulder River Scenic Drive and the West Boulder Scenic Drive. Additionally, to the south of town in the National Forest, along the banks of the Boulder River, some of the best primitive camping spots in Montana are located. All a camper needs to do is find a pull-out spot and set up shop, enjoying the beauty of the mountains and the excellent fishing found in the clear waters of the Boulder River. So is there anything to dislike about Big Timber? Well, someone in search of America’s shopping mecca might be disappointed since Big Timber has no “big-box” stores. Then again, who comes to Montana to shop, at least for items that aren’t directly related to fishing or other outdoor pursuits? The only other disappointment might be the self-serve car wash in town. Hanging quite prominently in the garage is a sign stating it was prohibited to wash a muddy or manure covered vehicle. As I was blankly staring at that sign while casting quick glances at my muddy and manure covered pickup truck, I wondered if this self-serve car wash received any business at all. After all, Big Timber is surrounded by ranches, the vehicles of which drive on “muddy and manure covered” roads all-day long. Since I was in a bit of a rebellious mood, I deposited my quarters and happily watched the mud and manure from my truck disappear down the drain, and felt no guilt whatsoever when driving away. So overall, if a visitor can live with limited shopping opportunities and avoid driving a “muddy or manure” covered vehicle into town that is in desperate need of a car wash, a visitor to Big Timber will find little to dislike about the town. There are a few smaller, indepenently owned motels in Big Timber. Most visitors, though, stay either at some of the guest lodges or at the local Super 8.